The thing that makes this “easy,” in theory, is that you don’t have to start on the stove, cooking your custard to make the base for the ice cream. But that’s only true if you use pasteurized eggs or you feel very, very lucky. Freezing doesn’t kill salmonella in food. This is not a “no-churn” recipe, however. The biggest obstacle in “no-churn” ice creams is inhibiting the formation of ice crystals, and one way to do that is to reduce the water in the recipe, and using evaporated milk is a way to do that, since evaporated milk is made by removing about 60% of milk’s water content. But those recipes don’t include eggs. 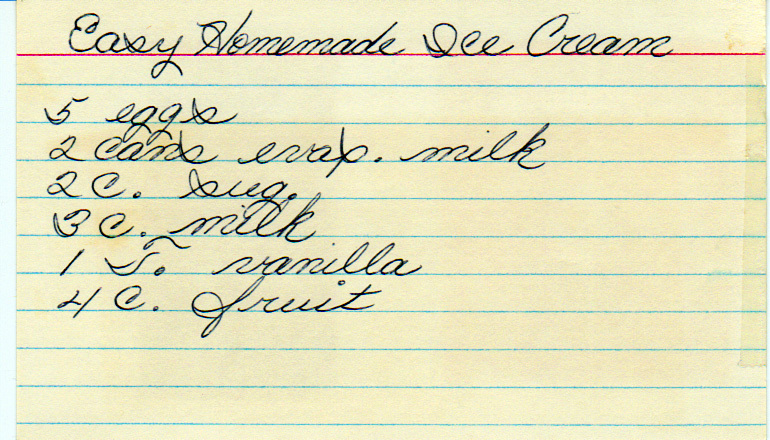 So this is only an easy recipe if we assume you don’t consider taking out the ice cream maker to be difficult. Gradually add sugar while whisking. Once sugar is incorporated, whisk in evaporated milk, then whole milk, then vanilla. Fold in berries and freeze in ice cream freezer according to directions. If you aren’t using pasteurized eggs, either pasteurize them by coddling them for one minute or don’t use this recipe and refer to a traditional, custard-based ice cream recipe, like this one.